You can use “Email Blacklist” feature to suppress the email sending to particular emails from your EasySendy Drip (or EasySendy Pro) dashboard. For example you can add the list of emails of your competitors to whom you never want to send any email campaign, even if you have got added in your other email list anywhere on EasySendy Drip (or EasySendy Pro) platform. You can easily suppress/blacklist the email address from your existing EasySendy Drip (or EasySendy Pro) account. In order to do this, you need to import your email list manually. Follow these steps to suppress the email address of your choice. 1. Go to List >Email Blacklist > Import . 2. 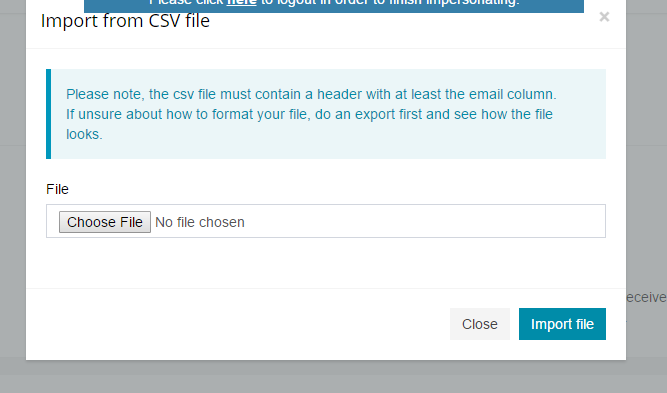 A pop-up box will appear on the screen, upload the CSV file. 1. Click on list > Email Blacklist > Export. 2. Download and extract the .CSV file accordingly. 1. Go to list > Email Blacklist> create new. 2. Then fill all the required fields manually and click on “Save Changes“. Note: You can also “Remove” the Blacklisted Email Address whenever you want.